Like the chanterelle, this is a mycorrhizal species that resists laboratory cultivation attempts. It requires a living host seedplant, typically a tree or shrub. Spores will not germinate on normal agar medias intended for saprophytic species. A slim chance of successful cultivation might be achieved by placing spores near the roots of a host plant seedling and then planting it in a suitable area and climate. 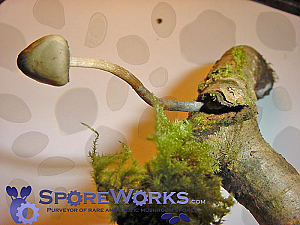 Locally, A. muscaria is often associated with shore pine and some other conifers such as douglas fir and spruce. It is rumored that a German or Austrian facility may have cultivated this species in the lab. Any information would be appreciated. Spores are white and placed on red paper. The prints are enormous, so expect a partial section of approximately 2 square inches. 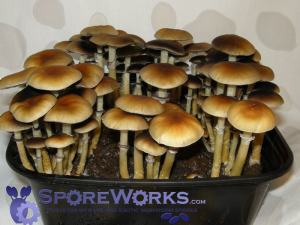 This picture is a good representation of the form and color of the strain who's spores we are offering. Picture provided by Amanita, thanks! * Spores intended for microscopy and taxonomy purposes only.